Easy installation and easy operation. Widely used in water project, water tower, water bucket, water tank, pond, etc. Output Type: Relay Output. Output Capacity: 10A. Sound & Vision. Due to the difference between different monitors, the picture may not reflect the actual color of the product. 10PCS x SPDT MTS-102 3-Pin SPDT ON-ON 6A 125VAC Mini Toggle Switches. SPDT 3A 250VAC/6A 125V. Pin number:3-Pin. Position: 2 (On-On). We'd like to settle any problem in a friendly manner. Insulation resistance: 100Mω(min). We want to make sure you are happy with our item. Goods without RMA number will NOT be accepted. Color: color. Model No. : FA2-10/2B. 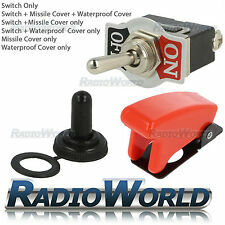 1pcs Electric Tool Switch. Color:As Picture. Light Color: as picture shows. As different computers display colors differently, the color of the actual item may vary slightly from the above images. Easy installation and easy operation. Widely used in water project, water tower, water bucket, water tank, pond, etc. Output Type: Relay Output. Output Capacity: 10A. Due to the difference between different monitors, the picture may not reflect the actual color of the product. Maximum current: 16A. Enterprise Networking & Server. Easy to assemble on the electric hand drill and convenient for usage. This switch is widely used in electric hand drill or other power tools. Speed is convenient to adjust, press down the switch button to start, the lower you press down, the speed is faster. Note: The real color of the item may be slightly different from the pictures shown on website caused by many factors such as brightness of your monitor and light brightness. 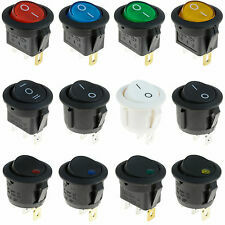 1 Auto Sensor Switch. Operation lllumination: Turn-ON＜ 30Lus, Turn-off ＜ 150Lus. On-(On) Momentary Foot Switch 3PDT. (Rated 250V AC/6A. Useful rocker switch. Switch button size:1.7cm/0.67"（L) x 1.1cm/0.43"(W). We will try our best to reduce the risk of the custom duties. 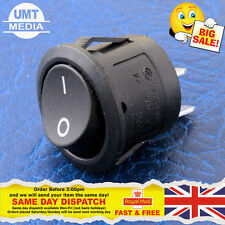 On-Off Toggle Flick Switch SPST 12V 25A. A normally-closed reed switch is closed when it is not near a magnet; as a magnet is brought close to it, a normally-closed switch will open. There are two types of reed switches: "normally open" reed switches and "normally closed" reed switches. You can follow below process to chontact us. color: as the picture shows. Import Duties. USD 1.83 553 sold. USD 1.92 980 sold. Switch type: Toggle. 1 x Toggle Switch. Switch body color: black. 1 x Waterproof Cover. due to strict custom inspection. Tank Pool Horizontal Water Level Switch. A float switch is a device used to sense the level of liquid within a tank, it may actuate a pump, an indicator, an alarm, or other device. Switching current: 0.5A. SKU:Z261 Features: 100% Brand New and High Quality Waterproof push button boot. Rubber boot unscrews for flush mounting applications (requires drilling hole). Ideal for application requiring a waterproof on-off push button switch. Easy control, easy installation. Operation: auto-lock. Single pole switch. Size: 1.7cmX1.4cm(LXW) Cable Length: 12cm Material: Rubber & Plastic Color: Black Quantity: 1 Set Net Weight: 10g Note: Lighting, display and other factors may cause COLOR SHADING, please comprehensive pictures and text descriptions to determine! Package Includes 1 x Waterproof Rubber Boot 1 x Switch Lead Wire 1 x Rubber Ring. RAZER All Series. Logitech All Series (MX, G). compatible with following mouse Apple G3 G4 G5. 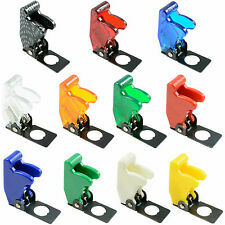 5 x Ultra Mini Long Lever Actuator Microswitch SPDT Sub Miniature Micro Switch. Liquid level sensor is installed under container (high level and low level). It can detect liquid level of various toxic substances, acid, alkali and all kinds liquid in high pressure airtight container. Working current: 16A. High switching capacity, strong anti-interference, features high stability. If you do not receive our reply within 48 hours, pls. If you are satisfied with our service, pls. Small size, simple wiring, low power consumption. 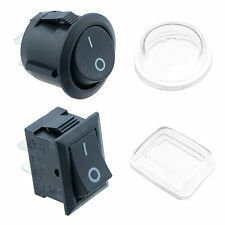 50pcs 6 x 6 x 5H mm TACT Switch Push Button. Specification of TACT switch Series. Actuation Force ： 1.3 -0.5N. Temperature ： -25°~ -85°C. Stainless Steel Float Switch. Max switching current: 0.5A. Material: Stainless Steel SUS. Switch Total Length: 61mm/2.4". Max carry current: 1A. Type SPDT(Latching). 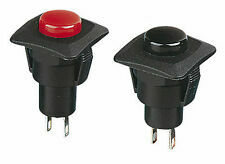 SPDT 3 Pins ON-OFF-ON 3 Position Toggle Switch. AC 125V, 6A. Waterproof rubber boot design. Position 3 Positions(ON/OFF/ON). Pin Number 3 Pins. Total Height 36mm / 1.4". Body Size(Approx.). 5.5x2.1mm DC Power Plug Jack. Connector size: 5.5mm x 2.1mm. Panel mounting. Otherwise deal is final. All products are quality checked. We will be happy to resolve any issues you may have in a cordial and friendly manner.